This is the replacement battery for the Vespa P-Series range, including P125X and P200. It is an unsealed type, meaning that you can add distilled water to it to help "resurrect" it if gets low on juice. 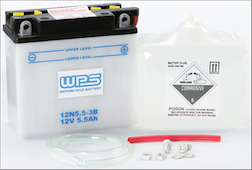 WPS is a good brand that provides a long-lasting battery (assuming it's maintained properly) at a good value price. See our item battery tender for more information how to properly maintain a scooter battery. People often ask us, what is the best scooter battery brand? The answer is Yuasa. They make the best (but usually a bit more expensive) batteries in the world. It is the brand that Vespa, Genuine, SYM and many other major brands use from the factory. They feature more lead than standard value brand batteries and if properly maintained, should be the best and longest lasting battery you could put in your scooter. This is the battery for your Vespa P-Series scooter, including P125X and P200. This item includes the sulfuric acid pack.